﻿ Petite body souffle - edible body butter reviews on EdenFantasys. If you're looking for something to inspire a brief massage that will quickly lead to more and dread the idea of using something that will cling to your skin, then this will be a fantastic product for you. With an ephemeral scent and taste, it does need to be sampled shortly after application, but it's a sure-fire way to integrate kisses into a simple massage. If you can afford it, it would make for a great daily moisturizer! Overall, I adored this product. The smell is like floating on a strawberry cream-cloud, and the taste is divine. Perfect for a variety of activities, this excellent souffle is something you can find a use for both inside the bedroom and out, though if you're looking for 24 hour skin moisture this might not be the item for you. The petite size makes it perfect for gift-giving as well. Kama Sutra is known for their yummy products, and their Petite Body Soufflé is no exception. 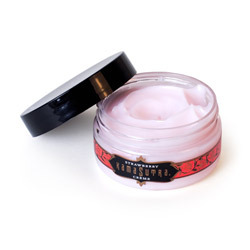 If you are a lover of novelty products like edible lotions, give this soufflé a try! It has a velvety texture and leaves skin smelling and tasting good- to make body kisses that much sweeter! Overall, I think this body scuffle is great. Me and my partner definitely enjoyed it and the size made it even better, because its travel friendly. Just the perfect size for our romantic mini-vacation. If you're planning on purchasing the Kama Sutra Body Souffle, I'd recommend you getting the larger jar. This jar is actually very tiny and wont last long. Overall, the chocolate creme brulee flavor tastes and smells absolutely amazing! I love everything about this product besides the size. While the aftertaste of the strawberry body souffle put me off, I still think this is generally a good product. It's not pumped full of lots of chemicals, though it does have some, including glycerin. As an edible body lotion, it really excels, and that's how we mainly use it. A little goes a long way! I do wish the mint flavor was available in this size...I'd like to try that one next. This is great for anyone. If you want to add something new to your foreplay, it is for you. If you want to smell like you taste good, it is for you. If you just want to taste good, it is also for you! You can use it as a massage lotion, or just use it as lotion and carry the smell around with you for the day. Souffle? I was thinking sorbet. What better way to make kisses sweeter than to add a little sweetness to them? This body souffle wonderfully mixes a nice light massage lotion with some tasty flavor and scent. There's also no sticky, greasy, icky residue left behind. Best of all worlds? Yes. It does also have a slight cooling and tingle sensation to it which isn't too great on your tongue, but adds a nice little touch to sensitive areas. Overall, it's some pretty neat stuff. This sweet treat is totally scrumptious and moisturizing. It will have both you and your partner ready to kiss the yummy cream off each other right away. Used for sensual massage or for silky skin, either way it will be sure to satisfy the sweetest of cravings. Sometimes it is best to pay a bit more when you find a high quality product, even if it means pinching pennies elsewhere in the budget. I love this body souffle and highly recommend it - BUT - I recommend that you pay a little bit more and buy it in the regular size versus the "petite" size. You'll get a better value for your money. I have yet to find another product that smells good AND tastes good like this does. If you're looking for a great, long lasting massage lotion that you'll get use out of everyday, try Kama Sutra's petite body souffle. It would make a great gift as well! If you're looking for a lotion with a great taste, this may not be the lotion for you. As a scented lotion, this one was a winner for me. Not only does it smell great and last long but I use it every day! Definitely worth it! Body Souffle by Kama Sutra is the perfect way to say "I love you" to that very special someone. Spread it on them and then kiss it off. They'll love being pampered while you'll love the sweet kisses. Put the saying "you smell good enough to eat" to the test with this delectable body soufflé that will have your lover's lips and hands all over you. Whether you use it as a personal body care item to lightly moisturize your skin with or as a sensual massage lotion during foreplay, this is one product you can't really go wrong with, unless you can't stand the scent of chocolate. The body souffle by kamasutra is a luxurious lotion that can be used anywhere on the body. It has a lovely smell and has a subtle taste. Its perfect for sharing, or keeping it to yourself. After a nice, romantic dinner, everyone wants a little sweet. Why not be the sweet? With Kama Sutra Chocolate Crème Brûlée Body Soufflé, you can do just that. With a delightfully delicious smell and taste, you will be one desert he, or she, cannot say no to.